Go green and get LEED Credits with our 100% Recycled Plastic Lot Blocks, Car Parking Stop, Wheel Stop or Car Stop. Whether you are building a new facility or replacing old unsightly concrete parking stops, our plastic car stops will not chip or crack like concrete. Our plastic wheel stops resist attack from gas, oil, salt, sunlight and chemicals. 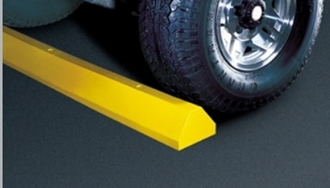 Parking lot block car stops are molded in solid colors and never need painting. At only 25 lbs each, our parking stops are light enough to ship via UPS and to be installed by one person. All this and at a great price! This product is not returnable unless damaged or defective. You can buy hardware from us, see part number PLASTICSTOPHARDWARE. Or, you may substitute rebar or 0.5 x 12" with 1.125 head steel spike for asphalt applications and 0.5 x 8" long lag screw hardware with expanding lag shield and 0.5" flat washers for concrete applications. These can be purchased at your local hardware store. This 6 foot plastic parking stop uses 3 sets of hardware for application. 1. Position parking block in its installation position and using its pre-drilled holes as templates, mark the location of each hole on the parking surface. 2. Remove the parking block. Using a high-speed hammer drill with a 3/4" masonry bit, drill a hole at each marked location to a depth of 3 1/2" below the parking surface. 3. Insert lag anchor into each hole (large anchor opening on top). Tap the anchor into the hole with a hammer so that the anchors are set flush with the surface. Place a washer over each anchor hole. 4. Reposition the plastic parking block in its installation position. Slip a washer onto a lag bolt, insert the bolt through a pre-drilled hole in the parking block and tighten the bolt about three quarters of the way with the 3/4" socket. Repeat for each hole in the parking block. Finish tightening each bolt until just snug. DO NOT OVER TIGHTEN! Excessive tightening may damage the block and void the product warranty. 1. Position the parking block in its installation position and using its pre-drilled holes as templates, mark the location for each hole on the parking surface. 2. Remove the plastic parking block. Using a high-speed hammer drill and a 3/8" masonry bit, drill a hole through the parking surface of each marked location to avoid fracturing the asphalt with the spike. 3. Reposition the parking block in its installation position. Drive the spike through the parking block and into the drilled hole until the spike is snug against the counter-bored surface of the parking blocks pre-drilled hole. DO NOT DRIVE BEYOND "SNUG". If driven too far spike may damage the parking block and void the product warranty. Go to top of this Plastic Lot Blocks Car Parking Stop, Wheel Stop page.